Central Research Institute, Jellice Co., Ltd.
Medical Care Proteomics Biotechnology Co., Ltd.
Collagen tripeptide (CTP) is a collagen hydrolysate containing a high concentration of tripeptides with a Gly-X-Y sequence, such as Gly-Pro-Hyp. 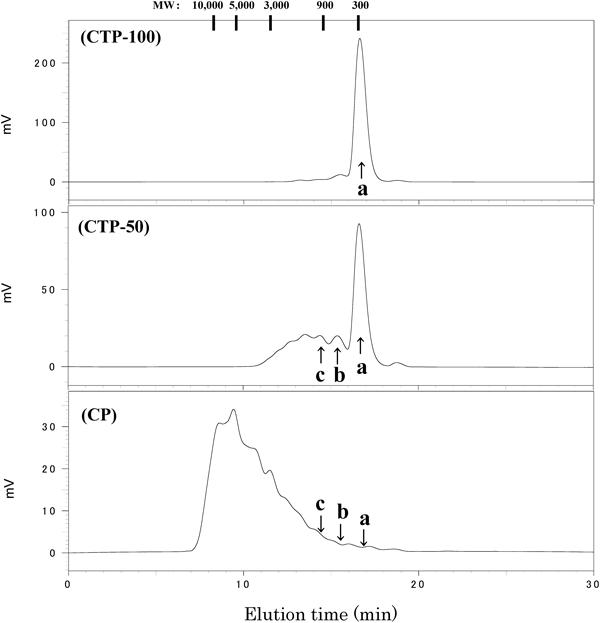 To test the effects of this preparation, we compared the absorption of peptides in humans after ingestion of a tripeptide fraction of CTP (CTP-100), a CTP preparation containing ca. 50% Gly-X-Y tripeptides (CTP-50), and a collagen peptide that did not contain tripeptides (CP). The postprandial levels of Gly-Pro-Hyp and Pro-Hyp in the plasma increased in those subjects who ingested CTP-100 and CTP-50, and were higher with greater Gly-Pro-Hyp ingestion. This demonstrated that collagen hydrolysates were efficiently absorbed when the collagen was ingested in the tripeptide form. Gly-Pro-Hyp and Pro-Hyp were also found in the urine after ingestion of CTP-100 or CTP-50. Similar to the results for the plasma concentration, the urinary excretion of Gly-Pro-Hyp and Pro-Hyp was also dependent on the amount of Gly-Pro-Hyp ingested. This indicates that ingested Gly-Pro-Hyp and generated Pro-Hyp were relatively stable in the body and were transported to the urine in the peptide form. The concentration of Hyp-Gly in the plasma was low after the ingestion of CP and CTP-100 but higher after the ingestion of CTP-50. Overall, our results suggest that tripeptides derived from collagen are absorbed efficiently by the body. Collagen is a protein found in the connective tissue such as the skin, bones, cartilages, and tendons, and accounts for approximately 30% of the total protein in the body. The primary sequence of the collagen peptide chain is unique in that glycine is repeated every three residues, forming the (Gly-X-Y)n sequence. The most frequently occurring sequence is Gly-Pro-Hyp.8) Collagen hydrolysates intended for consumption as food are produced from collagen extracted from animals or fish by digestion and solubilized by enzymatic degradation. Various products, ranging in average molecular weight from 1000 to 10000, are available. Iwai et al. have reported that diverse tripeptides and dipeptides appear in the blood of humans after ingestion of collagen hydrolysate.9) Furthermore, tripeptides and dipeptides originating from collagen have been shown to be physiologically active. For example, Gly-Pro-Hyp has been reported to interact with platelets10,11) and act on the central nervous system.12) Pro-Hyp has been reported to promote synthesis of hyaluronic acid13) and formation of articular cartilage,14) and Pro-Hyp and Hyp-Gly inhibit tumor necrosis factor induced inflammatory response.15) Gly-Pro reduces the blood pressure.16) Various beneficial effects observed after ingestion of collagen hydrolysate are considered to be closely related to these metabolized peptides. Moreover, since there are reports of dose-dependent effects, exploration of forms of collagen hydrolysate that can more easily be absorbed is of major significance. Previously, it has been reported that peptides in the blood are affected by the particular collagen preparation used for production of the collagen hydrolysate.17) Despite collagen hydrolysate products widely varying in molecular weight, the effects of differences in molecular weight on occurrence of the metabolized peptides in the blood is not completely understood. As in case of other proteins, collagen hydrolysates also undergo various degradation reactions in the digestive tract and are then absorbed mainly as amino acids, dipeptides, or tripeptides. In particular, dipeptides and tripeptides are directly absorbed into the body via the peptide transporter PEPT1 on the intestinal brush border membrane (BBM).18) Therefore, it may be possible to improve absorption efficiency and increase the concentration of metabolized peptides in the blood by ingesting collagen hydrolysates that have already been degraded into tripeptides and dipeptides. Using a technique to hydrolyze collagen specifically at every third peptide bond following a Gly residue, we prepared a hydrolysate comprising high-purity Gly-X-Y tripeptides [collagen tripeptides (CTP)]. In a previous study, we administered a CTP fraction to rats perorally or intraperitoneally to investigate the absorption of the metabolites into the blood. In that experiment, we found that metabolites represented by Gly-Pro-Hyp, Pro-Hyp, and Gly-Pro appeared in the blood at comparable rates and concentrations for the two administration routes.19) This result suggests that the body can absorb peptides efficiently if they are ingested in the tripeptide form. The beneficial effects of ingestion of collagen hydrolysate containing Gly-X-Y tripeptides include bone healing,20) protection against photoaging,21) anti-pruritus,22) and decrease in atherosclerotic plaques.23) Therefore, it is important to compare the effects of CTP metabolites and higher-molecular-weight collagen hydrolysates. Here we compare two different CTP preparations and a general collagen peptide in terms of changes in the blood concentrations of the major peptides (Gly-Pro-Hyp, Gly-Pro, Pro-Hyp, and Hyp-Gly) after oral ingestion by humans. We also report the effects of ingested components on peptide species excreted into the urine. CTP-100 and CTP-50 were prepared by Jellice Co., Ltd. Briefly, CTP-100 and CTP-50 were prepared from porcine skin collagen digested with a collagenase-type protease (Protease N, Nagase Chemtex Corporation, Osaka, Japan). The digest was deionized with an ion exchange resin (DIAION, Mitsubishi Chemical, Tokyo, Japan) and passed through a 0.2-µm filter. For CTP-100, the tripeptide fraction was isolated with reversed-phase (RP)-HPLC. Both oligopeptide fractions were included in CTP-50. CP was collagen hydrolysate with an average molecular weight of approximately 5000. CP did not contain Gly-Pro-Hyp but contained trace amounts of Pro-Hyp, Gly-Pro, and Hyp-Gly. To eliminate any effect of the raw materials from which the collagen was derived, the same porcine skin gelatin was used for the preparation of all samples. Each sample was dissolved in solvent to a 0.1% density and passed through a 0.45-µm filter. Samples were then analyzed using HPLC with a Superdex Peptide gel filtration column (GE Healthcare, U.K.) running at a flow rate of 1.0 mL/min with 10 mM Tris–HCl (pH 7.4) containing 0.15 mM NaCl and 5 mM CaCl2. Elution was monitored by absorbance at 214 nm. The average molecular weight of the samples were calculated from the chromatograms and calibration curve, obtained using the Pullulan standard. The elution times for the tripeptide, Gly-X-Y dimer, and Gly-X-Y trimer were determined for the standard peptides Gly-Pro-Hyp, (Gly-Pro-Hyp)2, and (Gly-Pro-Hyp)3, respectively. The content of total tripeptides were estimated by its peak area ratio. The content of Gly-Pro-Hyp, Pro-Hyp, Gly-Pro, and Hyp-Gly were estimated from LC-MS/MS with selected reaction monitoring (SRM) analysis described below. Gly-Pro-Hyp, Pro-Hyp, Gly-Pro, and Hyp-Gly were purchased from Wako Pure Chemical Industries, Ltd. (Osaka, Japan). (Gly-Pro-Hyp)2 and (Gly-Pro-Hyp)3 were synthesized by Kokusan Chemical Co. (Tokyo, Japan). The Pullulan standard was purchased from Showa Denko K.K. (Tokyo, Japan). Saline was purchased from Otsuka Pharmaceutical (Tokyo, Japan). LC-MS/MS-grade water, acetonitrile, formic acid, and trichloroacetic acid (TCA) were purchased from Wako Pure Chemical Industries, Ltd. The study was performed according to Helsinki Declaration and approved by the Ethical Review Committee for Clinical Research of Jellice Co. (date of approval: July 3, 2012). The participants were four healthy male volunteers from the Jellice Central Research Institute (age: 41.5±13.3 years; body weight: 59.6±4.7 kg), who had consented to participate in the study. Participants fasted for 12 h before starting the test. On the test day, participants ingested 80 mg/kg body weight of a test sample dissolved in 100 mL of water (average intake of Gly-Pro-Hyp in each sample: CTP-100, 5682 µmol; CTP-50, 1170 µmol; CP, 0 µmol). Each participant ate small rice balls (containing no animal protein) 65 min and 125 min after ingestion of the test sample. Because the test lasted for a long period of time during which blood was collected multiple times, the participants gradually consumed 30 mL of water every 30 min to prevent dehydration. Venous blood samples (approximately 5 mL each) were collected before the ingestion of the test sample and at 5, 15, 30, 60, 120, and 240 min after sample ingestion. The blood samples collected were centrifuged at 800×g for 10 min at 4°C, and the supernatant plasma samples recovered were stored at −80°C. Urine was collected immediately before sample ingestion and then over the following 12 h. Urine collected after ingestion was pooled for each participant. Part of the pre-ingestion urine samples were submitted immediately for creatinine measurement (performed by the Japan Community Healthcare Organization Sendai Hospital). The remainder and the urine samples after ingestion was stored at −80°C until LC-MS/MS with SRM analysis. The three test samples were tested in an identical manner, with an interval of at least 2 weeks between the tests. Plasma and urine were de-proteinized using 4% (v/v) TCA and centrifuged at 21880×g for 15 min at 4°C. The de-proteinized supernatant samples were analyzed by a LC-MS/MS system consisting of a Prominence UFLC L155 (Shimadzu, Kyoto, Japan) and a 4000 QTRAP system (AB Sciex, Way-Carlsbad, U.S.A.) was used to analyze all samples. A sample (10 µL) was injected and separated by a Sunniest RP-AQUA column (2.1 mm ×150 mm, 5 µm; ChromaNIK Technologies, Osaka, Japan) and then detected by the SRM mode. The HPLC gradient elution was conducted with eluents A [0.1% (v/v) formic acid/water] and B [0.1% (v/v) formic acid/acetonitrile]. Eluent B was linearly increased from 0–10% (0.0–0.5 min) and then to 30% (0.5–4.0 min). The flow rate was 0.2 mL/min and the column temperature was 30°C. The MS analytical conditions used were as follows: positive ion electrospray (ESI) mode at a capillary voltage of 4.5 kV, de-solvation voltage of 25 V, curtain gas (nitrogen) at 12 L/h, 65 psi, and 600°C. The SRM acquisition mode was used at a nitrogen gas pressure of 65 psi and a collision voltage of 30 V. The SRM transition ions and fragment types were as follows: Gly-Pro-Hyp [m/z 286.2–127.1(a2)], Pro-Hyp [m/z 229.1–132.1(y1)], Gly-Pro [m/z 173.1–116.1(y1)], Hyp-Gly [m/z 189.1–86.0 (Immonium)]. All data were acquired and processed with Analyst software, version 1.4.1 (AB Sciex). The concentration of each peptide was determined from the measured values. Furthermore, the trapezoid method was used to compute the area under the curve (AUC) from blood concentration changes over time. The total urinary excretion of each peptide after ingestion was calculated from its concentration in the urine and the total urine output. The total non-ingestion urinary excretion of each peptide over 12 h was estimated from the concentration of in the pre-ingestion urine samples. Urinary creatinine excretion was assumed as 1 g per 24 h, and the amount of each peptide per 0.5 g of creatinine was calculated to estimate the total urinary excretion over 12 h. The pre-ingestion urine samples were collected before each ingestion test, and the results are presented as the mean (n=12). Statistical analysis of the data was performed using Stat Flex for Windows, version 5.0. ANOVA was used to assess significant differences between samples. Differences were considered statistically significant at p<0.05. Figure 1 shows the gel permeation chromatograms of the three samples used in this study. Table 1 shows the average molecular weight and peptide contents for the three samples. CTP-100 had an average molecular weight of approximately 300, with tripeptides accounting for approximately 92% of the content, and did not contain polypeptides. CTP-50 had an average molecular weight of approximately 600, with tripeptides accounting for approximately 51% of the content, and also contained oligomers of (Gly-X-Y)n. CP samples had a widely distributed molecular weight, averaging approximately 5000. The wide distribution of molecular weight is a typical feature of products that have been randomly degraded by proteases. The Gly-Pro-Hyp content in CTP-100, CTP-50, and CP as measured by LC-MS/MS (SRM) analysis was approximately 34, 7, and 0%, respectively. All samples contained low concentrations of Pro-Hyp, Gly-Pro, and Hyp-Gly. Molecular weight (MW) shown at the top of the chart, was calculated from the elution time of pullulan standard. Arrows indicate elution positions of standard peptides. a: peak of Gly-Pro-Hyp, b: peak of (Gly-Pro-Hyp)2, c: peak of (Gly-Pro-Hyp)3. 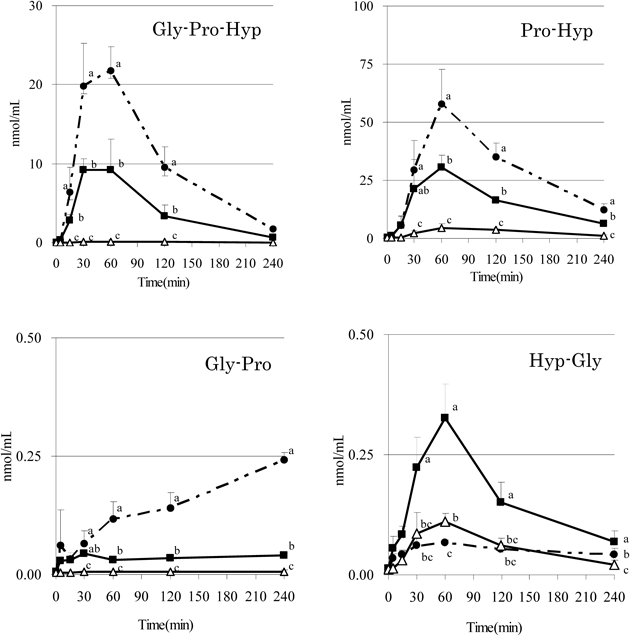 Figure 2 shows the changes over time in the concentrations of Gly-Pro-Hyp, Pro-Hyp, Gly-Pro, and Hyp-Gly in the blood after ingestion of the three collagen samples. For CTP-100 and CTP-50, the concentration of Gly-Pro-Hyp in the blood rapidly increased immediately after sample ingestion, and reached Tmax in 30–60 min. The concentration then decreased gradually and reached negligible levels 240 min after ingestion. The highest Cmax was obtained with CTP-100; Cmax for CTP-50 was approximately half of that of CTP-100. Gly-Pro-Hyp concentration after CP ingestion remained at lower levels: Tmax occurred at 60 min and Cmax was less than 1/60 of that of CTP-50. The concentration of Pro-Hyp also increased rapidly in the blood after CTP-100 or CTP-50 ingestion. The highest Cmax was obtained with CTP-100, with Cmax after ingestion of CTP-50 being approximately half of that of CTP-100. Pro-Hyp concentration after CP ingestion increased gradually, with Cmax of approximately 1/7 that of CTP-50. Tmax of Pro-Hyp occurred at 60 min after ingestion, and the concentration decreased gradually thereafter; however, small amounts of Pro-Hyp were still present in the blood 240 min after ingestion. The concentration of Gly-Pro in the blood increased over time after ingestion of CTP-100 with Tmax occurring at the last time point (240 min). However, the concentration of Gly-Pro remained constant after ingestion of CTP-50 or CP. Each bar represents as the mean±S.D. (n=4). a–cMeans with different letters indicate significantly different among the collagen samples (p<0.05). Symbols: CTP-100 (●), CTP-50(■), CP (△). With respect to Hyp-Gly, the Cmax after CP ingestion was only slightly higher than that after CTP-100 ingestion, and the concentration changes over time remained within a range comparable to those observed with CTP-100 ingestion. Furthermore, the Hyp-Gly Cmax was several times greater after CTP-50 ingestion than after CTP-100 or CP ingestion, and the concentrations remained high over time. Differences in the urinary excretion levels of metabolized peptides were investigated using urine samples pooled over 12 h after ingestion. The total pre-ingestion urinary amount of each peptide was calculated as the amount per 0.5 g of creatinine in urine samples collected before ingestion. The results of urinary metabolite concentration measurements are shown in Table 2. Pro-Hyp was the most abundant excreted peptide in the non-ingestion urine, followed by Gly-Pro-Hyp and Gly-Pro. Hyp-Gly was also detected in the non-ingestion urine, albeit at trace levels. The urinary excretion level of Gly-Pro-Hyp was the highest after ingestion of CTP-100, followed by after ingestion of CTP-50, and lowest after ingestion of CP. Pro-Hyp was excreted at high levels after collagen sample ingestion. The post-ingestion excretion levels of Pro-Hyp were highest after for CTP-100, followed by CTP-50, and lowest for CP. The excretion levels of Gly-Pro were higher after CTP-100 than after ingestion of CTP-50 and CP. There was no difference in the excretion levels between CTP-50 and CP ingestion. There were no differences in the excretion levels of Hyp-Gly among the three samples. Urine was collected immediately before sample ingestion and then over the following 12 h. The total urinary excretion of each peptide after ingestion was calculated from its concentration in the urine and the total urine output over 12 h. Values after ingestion are presented as the mean±S.D. (n=4). The total non-ingestion urinary excretion of each peptide was calculated as the amount per 0.5 g of creatinine in the spot urine samples before ingestion. Values in the non-ingestion urine are presented as the mean±S.D. (n=12). a–cValues with different letters in the same column are significantly different (p<0.05). In the present study, we compared peptide absorption and urinary excretion in humans after the ingestion of a tripeptide fraction of CTP (CTP-100), a CTP preparation containing approximately 50% tripeptides (CTP-50), or a collagen preparation that did not contain tripeptides (CP). Human participants ingested equivalent samples of the three preparations, and we then measured the concentration of Gly-Pro-Hyp and its metabolite dipeptides over time in the blood. The concentration of Gly-Pro-Hyp and Pro-Hyp in the blood increased rapidly after ingestion of CTP samples, being higher with greater Gly-Pro-Hyp ingestion, whereas the concentration change was substantially smaller after CP ingestion. This result indicates that Gly-Pro-Hyp was rapidly transported into the blood after ingestion, suggesting that the absorption efficiency for peptides can be markedly improved by ingesting them in a tripeptide form. Tmax was comparable for Gly-Pro-Hyp and Pro-Hyp, suggesting very rapid production of the metabolite Pro-Hyp. In a previous study in rats, it was suggested that the tripeptides were metabolized into dipeptides after being absorbed into the body (e.g., in the liver or blood) rather than primarily in the gastrointestinal tract. PEPT1 mediates tripeptide and dipeptide transport from the intestinal tract both in humans and in rats; therefore, we propose that Gly-Pro-Hyp was digested into Pro-Hyp in the blood and liver via the same mechanism as in rats, after being absorbed into blood in an intact form.19) Various physiological roles have been described for Pro-Hyp13,14) and our results indicate that administration of the Gly-Pro-Hyp precursor is a potentially effective means of delivering a high concentration of Pro-Hyp to the body. Although Ichikawa et al. reported a Pro-Hyp Tmax of 2 h in their study monitoring metabolites in the blood after ingestion of fish-scale gelatin (molecular weight (MW) ca. 5000), the Pro-Hyp Tmax after CP ingestion in our study was half of this, despite no appreciable difference in the average molecular weight of the collagen samples.24) However, the amount ingested in their study was 385 mg/kg body weight, which is approximately 4.8 times higher than the dosage used in the present study (80 mg/kg body weight). This difference in the amount ingested may have led to a difference in the time required for digestion and hence may account for the difference in Tmax. In addition, our CP sample was derived from porcine skin; differences in the source material and their corresponding molecular weight distributions therefore also represent possible causes for the difference in Tmax. The blood concentration of Gly-Pro, another Gly-Pro-Hyp metabolite, were highly small compared with those observed for Pro-Hyp. This suggests that Pro-Hyp is preferentially produced from Gly-Pro-Hyp in humans, and Gly-Pro is not actively released. The Tmax of Gly-Pro was slower than that of Gly-Pro-Hyp, Pro-Hyp and Hyp-Gly. This may indicate that Gly-Pro is generated by post-decomposition of Gly-Pro-X peptides after absorption. In addition, it has been reported that degradation of Gly-Pro in the body is difficult.25) The observed increase in the blood levels of Gly-Pro following the ingestion of CTP-100 and the constant levels of Gly-Pro after the ingestion of CTP-50 or CP may be related to these findings. The increase in the blood levels of Gly-Pro following the ingestion of only CTP-100 could be due to the large amount of Gly-Pro-X contained in CTP-100. The Hyp-Gly sequence occurs at a high frequency in polypeptide chains but is not released during metabolism of Gly-X-Y. Despite this, slight increases in Hyp-Gly concentration were detected in the blood after ingestion of CTP-100. Furthermore, the Hyp-Gly-rich CP showed concentration changes similar to those observed for CTP-100, and the AUC was comparable for both (data not shown). CTP-100 contains a trace amount of the Hyp-Gly dipeptide, which appears to have been transported into the blood intact. In other words, this result suggests that the intact Hyp-Gly dipeptide is transported into the blood in a highly efficient manner, rather than being released through the digestion of polypeptides. Liu et al. reported a study in rat jejunum showing that Hyp-Gly was detected in blood (in the perfusate) after administration of Hyp-Gly but after administration of the polypeptide (Pro-Hyp-Gly)5.26) Our results indicate that this also occurs in humans. However, after ingestion of CTP-50, which contains the same levels of Hyp-Gly as other two samples, the blood concentration of Hyp-Gly highly increased, to the highest concentration among the three samples. Our CTP-50 sample contained (Gly-X-Y)n oligomers in addition to tripeptides. Because the length and sequences of the oligomers were unified to (Gly-X-Y)n, Hyp-Gly may have been generated more efficiently from the CTP-50 than from the CP, which comprised random sequences. In particular, the presence of shorter oligomers in CTP-50 than in the (Pro-Hyp-Gly)5 polypeptide used by Liu et al. may have contributed to the formation of Hyp-Gly. However, a study using synthesized peptides is necessary to determine the exact molecular-weight zone from which Hyp-Gly was derived. Regarding the metabolic fate of Gly-Pro-Hyp beyond the blood, Watanabe-Kamiyama et al. have reported uptake by the kidneys in rats.27) Because peptides taken up by the kidneys are likely to be excreted in the urine, we measured the total peptide amount in 12-h post-ingestion urine pools. When CP was ingested, Pro-Hyp constituted the vast majority of the excreted peptides; however, when CTP-100 or CTP-50 was ingested, Gly-Pro-Hyp was also observed in the urine. This result indicates that Gly-Pro-Hyp administered in a tripeptide form remained intact over the entire pathway to excretion. Therefore, it appears that Gly-Pro-Hyp is relatively stable in the body, although approximately half of it degraded into Pro-Hyp. Gly-Pro and Hyp-Gly were produced at substantially lower levels compared with Gly-Pro-Hyp, Pro-Hyp; differences among samples in Gly-Pro and Hyp-Gly excretion may thus have been difficult to observe. These results demonstrate that ingestion of a collagen tripeptide can improve the efficiency of peptide absorption into the blood compared with ingestion of collagen peptides. Furthermore, ingested peptides and generated peptides were transported to the urine while maintaining peptide form. The most important challenge in the future is to verify the biological effects of the increased absorption rates and reduced molecular weights. A number of studies on tripeptides and dipeptides derived from collagen have reported dose-dependent biological effects. Therefore, it may be anticipated that these beneficial effects are further improved by ingestion of a more easily absorbed form of collagen hydrolysate. Meanwhile, this study was limited to an investigation of the blood transport of only a few peptides; we expect that all tripeptides and dipeptides derived from collagen are not necessarily transported into the blood at a uniformly high concentration. There are many barriers to be crossed before ingested components reach the blood, such as enzymatic degradation and transporter affinity; therefore, separate studies should necessarily be conducted on individual peptides of interest. The concentration of Hyp-containing peptides can reach the blood depends on the source of the gelatin,17) but such differences in absorption efficiency may be presumed to be infinitesimally small when the source material is hydrolyzed to tripeptide size, as in this study. This research was supported by the Subsidies for projects to promote the enhancement of manufacturing technology for small and medium enterprises from the Ministry of Economy, Trade and Industry of Japan. The authors thank members of the Japan Community Health Care Organization Sendai Hospital Health Diagnostic Center for their cooperation in blood sampling and urine analysis. Yasuo Sakai is the director of Jellice Co., Ltd. Shoko Yamamoto, Masamichi Onuma, and Noriaki Numata are employees of Jellice Co., Ltd.
1) Moskowitz RW. Role of collagen hydrolysate in bone and joint disease. Semin. Arthritis Rheum., 30, 87–99 (2000). 2) Wu J, Fujioka M, Sugimoto K, Mu G, Ishimi Y. Assessment of effectiveness of oral administration of collagen peptide on bone metabolism in growing and mature rats. J. Bone Miner. Metab., 22, 547–553 (2004). 3) Nomura Y, Oohashi K, Watanabe M, Kasugai S. Increase in bone mineral density through oral administration of shark gelatin to ovariectomized rats. Nutrition, 21, 1120–1126 (2005). 4) Saiga-Egusa A, Iwai K, Hayakawa T, Takahata Y, Morimatsu F. Antihypertensive effects and endothelial progenitor cell activation by intake of chicken collagen hydrolysate in pre- and mild-hypertension. Biosci. Biotechnol. Biochem., 73, 422–424 (2009). 5) Matsumoto H, Ohara H, Ito K, Nakamura Y, Takahashi S. Clinical effects of fish type I collagen hydrolysate on skin properties. ITE Lett. Batter. New Technol. Med., 7, 386–390 (2006). 6) Ohara H, Ito K, Iida H, Matsumoto H. Improvement in the moisture content of the stratum corneum following 4 weeks of collagen hydrolysate ingestion. Nippon Shokuhin Kagaku Kogaku Kaishi, 56, 137–145 (2009). 7) Kouguchi T, Ohmori T, Shimizu M, Takahata Y, Maeyama Y, Suzuki T, Morimatsu F, Tanabe S. Effects of a chicken collagen hydrolysate on the circulation system in subjects with mild hypertension or high-normal blood pressure. Biosci. Biotechnol. Biochem., 77, 691–696 (2013). 8) Ramshaw JA, Shah NK, Brodsky B. Gly-X-Y tripeptide frequencies in collagen: A context for host–guest triple-helical peptides. J. Struct. Biol., 122, 86–91 (1998). 9) Iwai K, Hasegawa T, Taguchi Y, Morimatsu F, Sato K, Nakamura Y, Higashi A, Kido Y, Nakabo Y, Ohtsuki K. Identification of food-derived collagen peptides in human blood after oral ingestion of gelatin hydrolysates. J. Agric. Food Chem., 53, 6531–6536 (2005). 10) Postlethwaite AE, Seyer JM, Kang AH. Chemotactic attraction of human fibroblasts to types I, II, and III collagens and collagen-derived peptides. Proc. Natl. Acad. Sci. U.S.A., 75, 871–875 (1978). 11) Laskin DL, Kimura T, Sakakibara S, Riley DJ, Berg RA. Chemotactic activity of collagen-like polypeptides for human peripheral blood neutrophils. J. Leukoc. Biol., 39, 255–266 (1986). 12) Wiśniewski K, Artemowicz B, Lutostańska A, Maćkowiak J, Koziołkiewicz W. Central activity of peptide Gly-Pro-Hyp-. The main component of collagen degradation products mixture. Acta Neurobiol. Exp., 54, 33–38 (1994). 13) Ohara H, Ichikawa S, Matsumoto H, Akiyama M, Fujimoto N, Kobayashi T, Tajima S. Collagen-derived dipeptide, proline–hydroxyproline, stimulates cell proliferation and hyaluronic acid synthesis in cultured human dermal fibroblasts. J. Dermatol., 37, 330–338 (2010). 14) Nakatani S, Mano H, Sampei C, Shimizu J, Wada M. Chondroprotective effect of the bioactive peptide prolyl–hydroxyproline in mouse articular cartilage in vitro and in vivo. Osteoarthritis Cartilage, 17, 1620–1627 (2009). 15) Kouguchi T, Ito A, Iwai K, Shimizu M, Takahata Y, Suzuki T, Morimatsu F, Tanabe S. Chicken collagen hydrolysate-derived peptides inhibit tumor necrosis factor-α-induced inflammatory response in endothelial cells. Food Sci. Technol. Res., 18, 667–671 (2012). 16) Ichimura T, Yamanaka A, Otsuka T, Yamashita E, Maruyama S. Antihypertensive effect of enzymatic hydrolysate of collagen and Gly-Pro in spontaneously hypertensive rats. Biosci. Biotechnol. Biochem., 73, 2317–2319 (2009). 17) Ohara H, Matsumoto H, Ito K, Iwai K, Sato K. Comparison of quantity and structures of hydroxyproline-containing peptides in human blood after oral ingestion of gelatin hydrolysates from different sources. J. Agric. Food Chem., 55, 1532–1535 (2007). 18) Abe M, Hoshi T, Tajima A. Characteristics of transmural potential changes associated with the proton–peptide co-transport in toad small intestine. J. Physiol., 394, 481–499 (1987). 19) Yamamoto S, Hayasaka F, Deguchi K, Okudera T, Furusawa T, Sakai Y. Absorption and plasma kinetics of collagen tripeptide after peroral or intraperitoneal administration in rats. Biosci. Biotechnol. Biochem., 79, 2026–2033 (2015). 20) Hata S, Hayakawa T, Okada H, Hayashi K, Akimoto Y, Yamamoto H. Effect of oral administration of high advanced-collagen tripeptide (HACP) on bone healing process in rat. J. Hard Tissue Biol., 17, 17–22 (2008). 21) Pyun HB, Kim M, Park J, Sakai Y, Numata N, Shin JY, Shin HJ, Kim DU, Hwang JK. Effects of collagen tripeptide supplement on photoaging and epidermal skin barrier in UVB-exposed hairless mice. Prev. Nutr. Food Sci., 17, 245–253 (2012). 22) Okawa T, Yamaguchi Y, Takada S, Sakai Y, Numata N, Nakamura F, Nagashima Y, Ikezawa Z, Aihara M. Oral administration of collagen tripeptide improves dryness and pruritus in the acetone-induced dry skin model. J. Dermatol. Sci., 66, 136–143 (2012). 23) Tang L, Sakai Y, Ueda Y, Katsuda S. Effects of oral administration of tripeptides derived from type I collagen (collagen tripeptide) on atherosclerosis development in hypercholesterolemic rabbits. J. Biosci. Bioeng., 119, 558–563 (2015). 24) Ichikawa S, Morifuji M, Ohara H, Matsumoto H, Takeuchi Y, Sato K. Hydroxyproline-containing dipeptides and tripeptides quantified at high concentration in human blood after oral administration of gelatin hydrolysate. Int. J. Food Sci. Nutr., 61, 52–60 (2010). 25) Ganapathy V, Leibach FH. Role of pH gradient and membrane potential in dipeptide transport in intestinal and renal brush border membrane resicles from the rabbit. Studies with L-carnosine and glycyl-L-proline. J. Biol. Chem., 258, 14189–14192 (1983). 26) Liu C, Sugita K, Nihei K, Yoneyama K, Tanaka H. Absorption of hydroxyproline-containing peptides in vascularly perfused rat small intestine in situ. Biosci. Biotechnol. Biochem., 73, 1741–1747 (2009). 27) Watanabe-Kamiyama M, Shimizu M, Kamiyama S, Taguchi Y, Sone H, Morimatsu F, Shirakawa H, Furukawa Y, Komai M. Absorption and effectiveness of orally administered low molecular weight collagen hydrolysate in rats. J. Agric. Food Chem., 58, 835–841 (2010).